Reflections on Opera, Faith and the Orient examines the portrayal of ancient religions and the Orient in operas and incidental music by Ludwig van Beethoven, W. A. Mozart, Gioachino Rossini, Gasparo Spontini, Richard Wagner and Carl Maria von Weber. The book adds to our understanding about the manifestation of classic aesthetic heritage in late eighteenth- and early to mid-nineteenth-century musical culture, opera in particular. The author especially uncovers traces of Dionysian aesthetics. 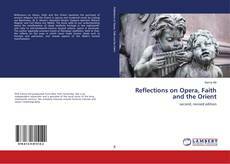 Next to that, she reflects on the ways in which music made known ideals such as heroism and patriotism, and reveals aspects of the libido's musical manifestation.